I don’t actually hand wash a whole lot of dishes anymore. 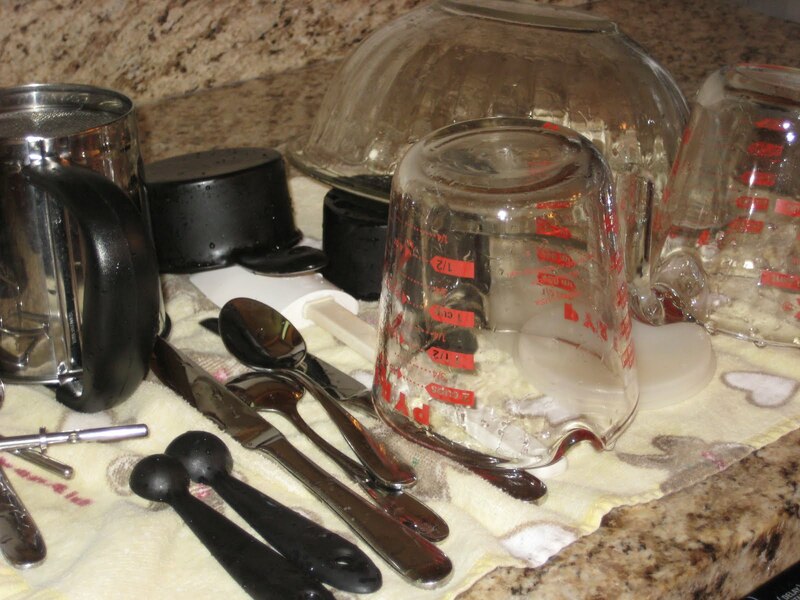 I often hand wash when I am baking and need some of my cups, measuring spoons etc. to be clean for another use. This was true on Friday when I was making my hubby’s Birthday cake and needed the stuff to be clean in order to make the frosting. 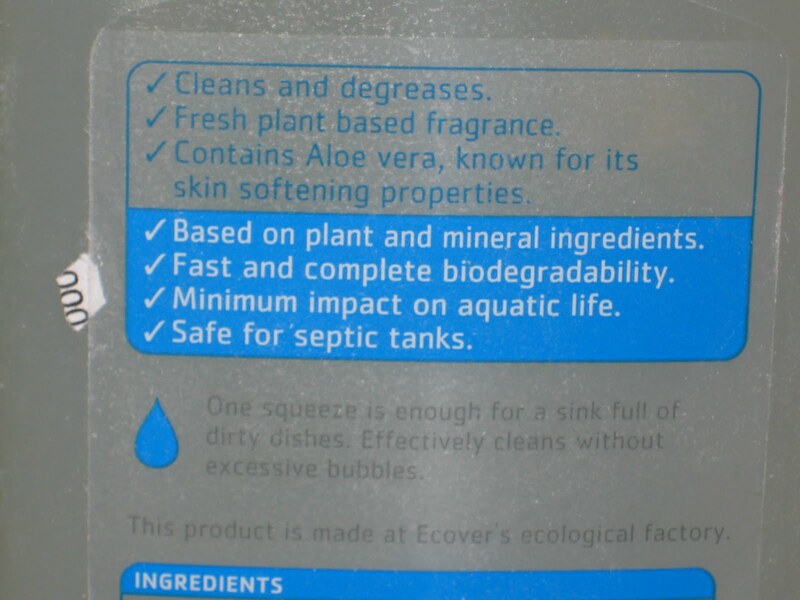 My Ecover Ecological Dishwashing Liquid came in the mail that day, so it was perfect timing. The Lemon and Aloe Vera Dishwashing Liquid came packaged in shredded material. I love this re-purposing. The scent was mild and pleasant, just a light citrus. It’s both effective and environmentally friendly. Simple ingredients, but do note that it contains wheat proteins. I just used a little dab. It was sudsy enough to work but didn’t make a big mess of bubbles. 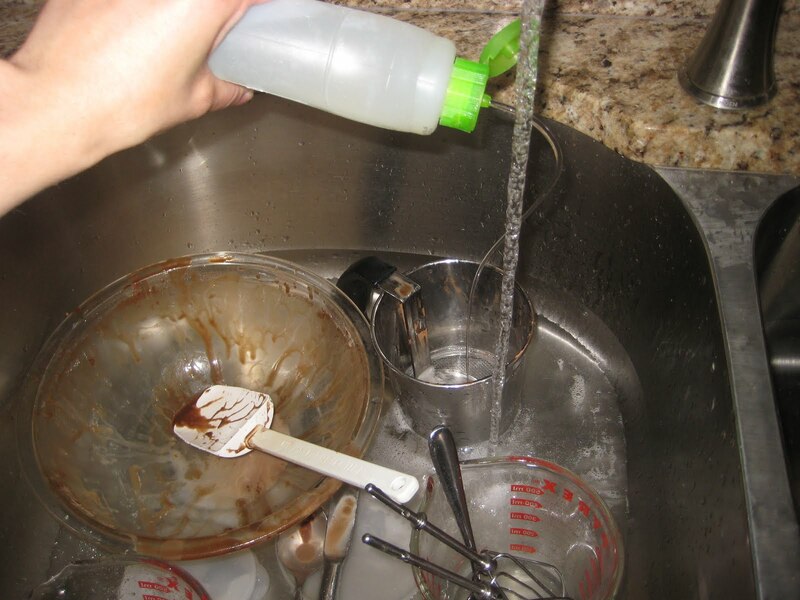 I’m not too picky about my dish soap, but I know what I don’t like: too much/not enough sudsing, not rinsing clean, leaving water spots, strong scents (especially flowery stuff), leaving my hands either dry or slimy and other things I’m sure I’m not thinking of right now! The Ecover was great. The dishes were clean, my hands felt fine, the scent was light. No suds mountain in the sink either. Eek, my sink needs a good cleaning though! One last shot, the fruits (cake?) of my labor! Best. Chocolate. Cake. Recipe. Ever. So gooey and delicious. Even my Dad likes it and he’s a weirdo that likes everything “cakey.” He even prefers dry, cakey brownies to rich, gooey ones. I know, what a freak. I must be adopted. Ecover also makes automatic dishwasher tablets and powder, rinse aid, two other dish soap scents, lots of other environmentally friendly cleaning products, laundry products and even car and boat care products. Check the store locator and then print coupons to save on Ecover products! Thank you to Ecover for sending me the dish detergent at no charge. The freebie in no way affected my review and all opinions (and cakes!) are my own. >I've tried their fabric softener, which I loved as well. But I am on the search for a great dish soap with the same specifics you wanted… so thank you or this review. I think I will check it out.